So what have we been up to? Well loads, actually. We've just returned from an Australian jaunt, one that saw us co-presenting a chat show called The Living Room. And, to keep our designer muscles flexed as our Antipodean trip gathered pace, we spent time "sexing up the suburbs" by redesigning some particularly style-free homes for Channel 10, one of Australia's primary networks. Anything else? Yup: we hosted a glittering gala for 700 dinner guests (on a floating pontoon, no less, in Sydney's Darling Harbour) for Reid Gift Fairs, a huge global event organizer with whom we've recently been working. Safely returned to Canadian soil, we've been dashing cross-country on a "Cabin Pressure" promo tour where, during various chat shows, we mooted cottage country as a potential new arena for property investors. God knows it certainly seems there's little left in the urban or suburban space from which speculators can benefit. So why not? 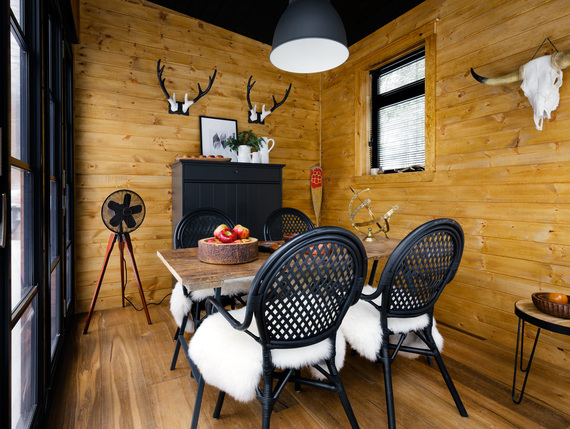 This week we're toiling in the UK, but this weekend we're flying to Edmonton to headline The Cottage Life and Cabin Show: if you're over that way, drop by and see us. Check out for details. And, in the meantime, there's a whole load of C&J action to come on the small screen. This Sunday, you'll find us immersed in the aforementioned "Cabin Pressure" (as indeed you will every week) and, the following Tuesday, we'll be popping up as guest judges on Game of Homes -- catch us, 10 p.m., on The W Network. 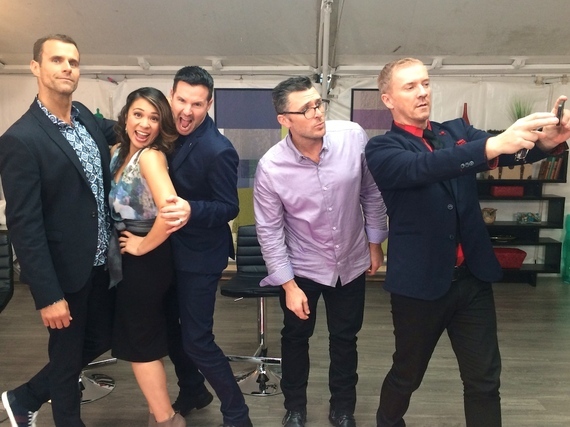 The last ep' before the atom splitting finale (where one lucky couple will win a house! ), the drama, between team factions, is escalating. Our segments were filmed a few months back, and we GENUINELY have no idea who takes the big prize on the groundbreaking show. That won't actually be revealed until the grand finale. It's wildly entertaining (put even the loveliest sets of people together, add a house as the grand prize, and watch them show their, ahem, every side as they battle towards victory!) but what makes it extra special is the environmental bonus: the houses featured would have been demolished -- and consigned to landfill -- had they not been uprooted, lock stock and barrel, then delivered cross Canada to downtown Vancouver to be repaired by W Network's competing teams. Think Monster Moves meets Big Brother, with just a sprinkling of Trading Spaces thrown in for good measure. On next Tuesday's Game of Homes, we step into the mix to judge exterior makeovers and provide our tuppence worth as far as 'curb appeal' is concerned. No point, after all, making it all double dreamy gorgeous inside if those all-important exteriors details aren't up to par, right? Together with host Cameron Mathison (from ABC and Dancing With The Stars) and resident judges Cheryl Torrenueva (designer from Restaurant Impossible and co host of Home Heist, our previous HGTV show) and Jeremy MacPherson, we look on in wonder as rooflines are changed, porches added, siding replaced and colour schemed dramatically updated. As we oft opine, curb appeal is the final dressing that brings "first impressions" alive. On this Sunday's equally exciting episode of Cabin Pressure, we set to work improving cottage country's curb appeal equivalent: "lakeside allure." Yup, as viewed from the water, our formerly slanty shanty's exterior has been totally updated via auspicious landscaping and the addition of a (small but perfectly-formed) guest annex. It's cute to the power of ten. Prepare to elevate when you see us reveal the fruits of our decorative labour this weekend. For us, the bunkie is a critical part of cottage life and indeed the perfect over spill for friends and family. Appraising the ones within which we've taken up temporary guest residence over the last few years, it's fair to suggest some have been diminutive (to say the very least) whereas others have been commodious self-contained suites with every conceivable luxury slung into the mix. Running water, electricity, comfy sofas, inviting beds -- the lot. And so it came to pass that, as we started dreaming about our new bunkie, we were absolutely certain who we should call to create it -- Canada Builds (http://www.canadabuilds.ca), the same chaps who built the guest annex as featured during Cabin Pressure Season One. Back then, with a larger cottage and eminently more convenient road access, we went to town and birthed what was essentially a condo in the forest: a glass sided monolith with two-bedrooms, a self-contained living room and a totally tricked out shower room. This time around? Roads -- actually dirt paths in some places -- that are windier than a helter-skelter and with more ups and downs than Britney Spears' career. Thus, appraising access alone, we had to be far more modest as we conspired our drawings for the guest wing. 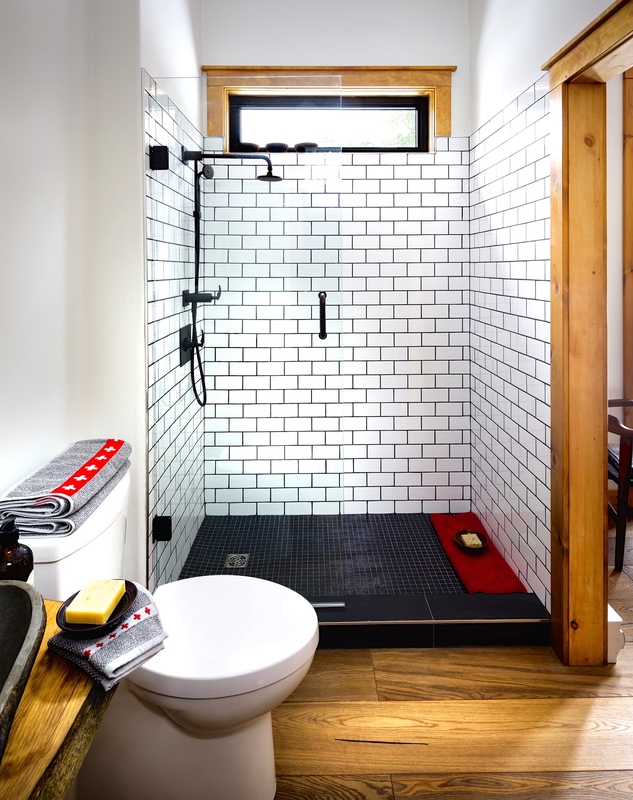 The team at Canada Builds, mindful of the unnasumed track that snakes towards us, built a space with a four bunk bedded sleep zone, an "indoors/outdoors" dining area and a neat wee shower room sandwiched between. Scale? Let's just say that last year's bunkie was the best part of 50 feet long. Whereas this year's measures a modest 18, end to end. Constructed in the "modular" fashion and pieced together off site at the company's HQ in Lindsay, it was delivered to Haliburton on a flat bed truck in a well planned, almost army like well manoevre. 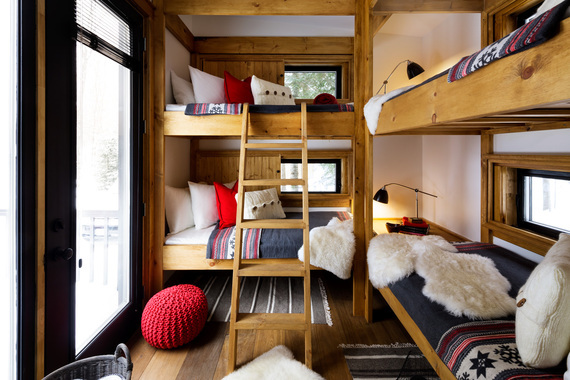 We're tickled pink with the way it has all come together and we hope, for starters, that you'll adore the comfy wee sleep zone which we dressed in a woodsy palette accented with shots of red and white. You can almost hear the joyful strains of familial choirs singing "Oh Canada" as you scan its every nook and cranny. Sure, it's compact, but it works: tune in to see how we made the 8 x 8 feet bedroom room accommodate FOUR adult guests. With room for storage and even a small seating area. 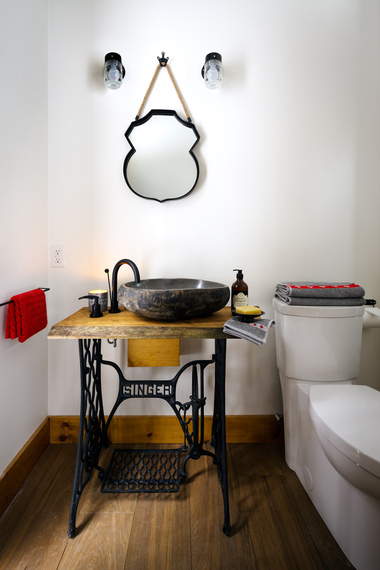 The grey grouted, white subway tiled bathroom, too, is a triumph: accented with black faucets and ebony toned shower fittings, it features an old Singer sewing machine table base as its vanity unit. Re-versioned with a slab of live edge lumber and a weighty Unikstone basin (http://www.unikstone.ca) it's the perfect place for guests to freshen up before settling down to dinner in the compact dining room that lies through the wall. In there, Weather Master Plus doors (with built in bug screens) installed by Nortech (http://www.nortechhomeimprovements.com) concertina open and closed to embrace the great outdoors as and when required. To amplify "connectivity" to the main house, we sided the bunkie in grey lapboard. Detailed with black soffit it echoes the roofline of its architecturally bigger sibling. 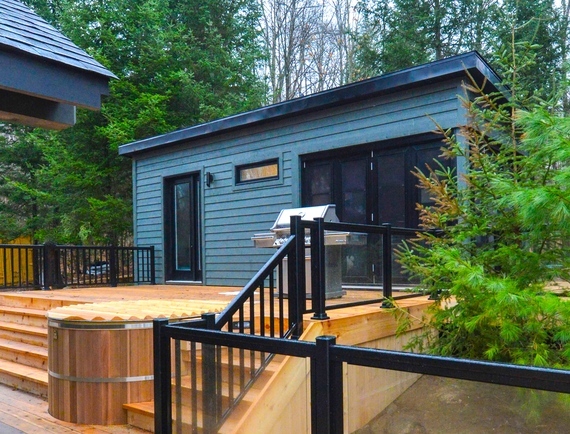 The bunkie sits on a raised platform (six feet above ground level) with Western Red Cedar steps leading to the main decked area, but both zones visually connect thanks to potted shrubs and furniture. 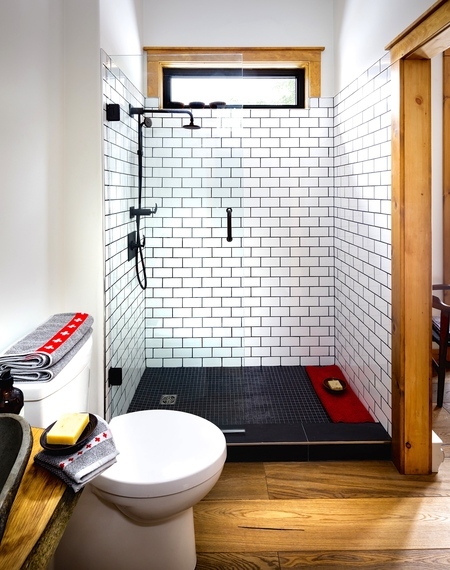 Between the upper and lower decked platforms sits one of the loveliest products we've ever specified: a cedar dip pond by Canadian Hot Tubs (http://www.canhottub.com) The gently bubbling spa is a welcome relief from typical boxy plastic affairs, yet every bit as efficient. This is the family company's first TV appearance, and we're certain it'll be a game changer for them. The beautiful tub is literally like a giant barrel and has already proved an outright winner: no matter the climate it's a joy to immerse in the frothy waters! Whatever you have lined up over the next wee while, we hope you'll tune into Cabin Pressure (episode 5) as it hits the airwaves, this Sunday, 26th March. And we hope you'll be with us for Game of Homes when Tuesday the 28th comes. Whether you need cottage inspiration, or the excitement of watching four couples vying to win a house, there's something in our TV output for everyone. Double bubble C&J? Enjoy! Cabin Pressure airs Sundays at 9pm on Cottage Life television - the network is currently in free preview. Installation and filming... it's not easy being a TV show build team! Cladding, deck and hot tub in place - only thing left to do now is to strike up the barbecue!